Dato’ Roslina has broad experience in the energy sector in the areas of Utility Economics, Regulation, Energy Procurement, Planning and Strategy. She had served Lembaga Letrik Negara/Tenaga Nasional Berhad (“TNB”) for 33 years, worked in various divisions in TNB such as Distribution, Planning, Business Strategy, Regulations, Transmission and Corporate Planning. She currently sits on the Boards of TNB Fuel Services Sdn Bhd and Prai Power Sdn Bhd. In addition, Dato’ Roslina currently is a Senior Fellow at Khazanah Nasional. 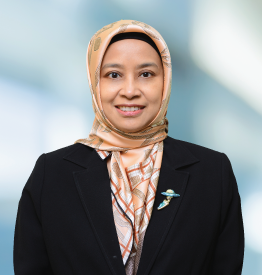 Dato’ Roslina was appointed as Vice President of Regulatory Economics and Planning Division from 1 April 2009 until the expiration of her contract on 31 March 2018. Between 1990 to 1992, she was seconded to the Economics Planning Unit of the Prime Minister’s Office as an assistant Director to advise on energy matters.